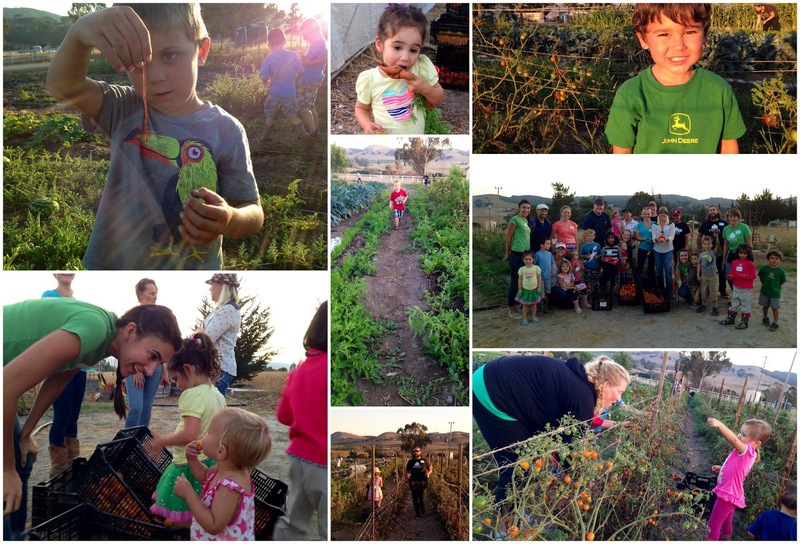 A wonderful group of families turned out to harvest at Firstfruits Farm last Friday evening September 12th. Thanks to all who got dirty and picked 790 pounds of tomatoes, lettuce, corn, carrots, melons, zucchini, kale, basil, bell peppers and eggplant! The produce was delivered the next morning to "God's Storehouse," a huge Food Bank distribution site in SLO which feeds 230+ families every Saturday. Jen Miller of GleanSLO was so impressed with our mission of raising kids with a sense of community: "I hope all of your families will feel the magnitude of your one hour of hard work. Each piece of produce you carefully picked was received with such gratitude. It may be the only fresh food [the recipients] will eat all week.... My heart overflows with gratitude for the type of childhood these kids are experiencing… the freedom to be a kid, eat real, good, homegrown food, and learning the normalcy of giving back to our neighbors that need a little help." Firstfruits Farm volunteers were also so appreciative. They stressed taste testing as we picked and offered produce for us to take home. What a Win-Win night, complete with gorgeous Central Coast weather.